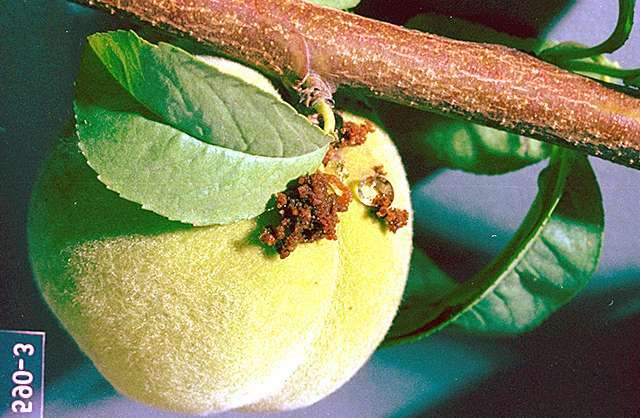 Pest description and damage Peach twig borer is a European insect first found in California in the 1880s. It is a major pest of apricots, peaches, plums, and prunes. There are no native hosts outside the orchard. 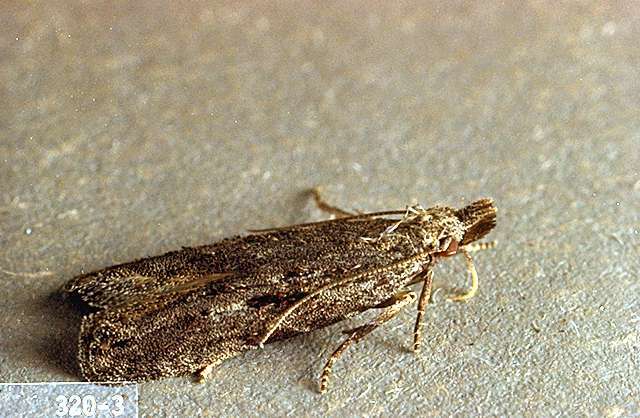 The adult is a steel-gray moth with white and dark scales, about 0.33 to 0.5 inch long. The larva is a caterpillar, approximately 0.5 inch long, with a dark brown head and distinctive, alternating light and dark bands on the body. The pupa is smooth and brown. The larva of the borer causes injury to fruit and trees. 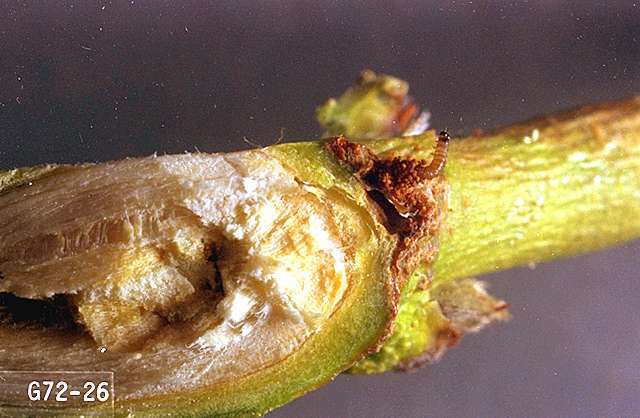 Feeding on the buds and twigs occurs early in the season, after which the larva bores into the shoots, causing a characteristic "flagging" or wilting of the new growth. Later generations of larvae feed on shoots or fruit, disfiguring the fruit. Biology and life history The borer overwinters as an immature larva in tunnels constructed in the crotches of twigs and branches. These overwintering sites can be identified by the small chimneys of frass and wood chips produced by the feeding of the larvae. Larvae become active at the pink bud stage and emerge to feed on buds and young leaves before boring into a shoot. These larvae eventually leave the mined shoot to pupate. Adults emerge in mid- to late May. Eggs are laid on fruit, shoots, or undersides of leaves. Eggs are yellowish-white to orange. The eggs hatch, and these larvae feed and mature on shoots and immature fruit. The next adult flight is in mid-July. Part of the larvae from this flight overwinter, the rest produce a partial third flight. Pest monitoring Check for overwintering sites on small trees. Otherwise, examine shoots in late April or early May. Wilted shoots are easy to spot, and you should open them to check for larvae. A tiny parasitic wasp that parasitizes eggs is active in orchards at shuck fall. Cut out mined shoots below the wilted area to eliminate larvae. Overwintering larvae may be found under thin bark in branch axils and destroyed. Look for a buildup of chewed bark and frass.